My girls read Mere Christianity by C.S. Lewis for school this year, and they struggled with it a bit. I didn't feel like they got as much out of it as they could have, which was concerning to me. I've been reading it too and LOVE IT. I hadn't read it before, and it has been a life-changing read for me. I had only read the preface, and underlined about half of it, when I talked with my brother about the book. He told me to stop underlining C.S. Lewis, because most of the book would be highlighted which completely defeats the purpose. That made me laugh, but he was right. 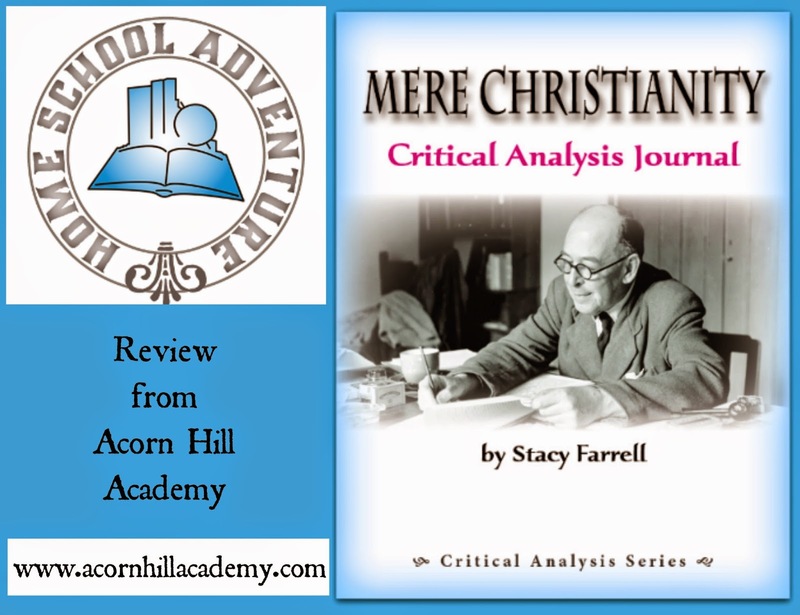 When the opportunity arose to review the Mere Christianity Journal from Home School Adventure Co., I was thrilled. The journal is intended for students aged 12 and up, and is available as either a printed book or an interactive PDF download. 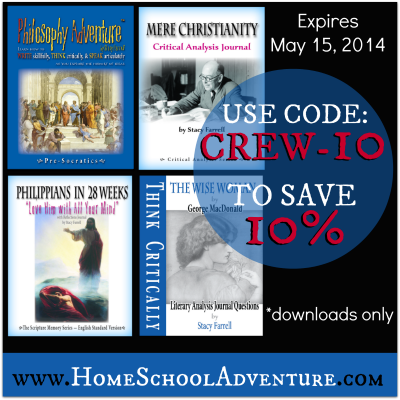 It was originally created as a companion product to go along with Philosophy Adventure, another program available from Home School Adventure Co., but you can easily use it as a stand-alone study. We received the download version, which allows students to type their answers directly into fields in the PDF file. That's a nice feature if you have someone who would prefer to type. I printed one copy for us to use during our time together. Because the girls didn't seem to connect with the book when they read it last term, I decided that we would read it together and do the questions orally. That worked well, and sparked some great discussions. I love talking about this kind of thing with my girls, especially because they are going through confirmation at church, and are at the age of questioning. They seem more open to answering questions written by someone else, because it's not "just mom again," if you know what I mean. My mom also read through some of the book and questions when she visited in March, and she and the girls worked through a few chapters. I know they all enjoyed that time together. My girls appreciated that the questions were clear and helped pull them into what Mr. Lewis was trying to get across. There are 10-16 questions to go along with each chapter. I had some concerns about using the journal, because I wanted my girls to make their own connections with the material. However, I was pleasantly surprised with the questions put forth in this book. Rather than asking students to look for specific facts or to define vocabulary words, the questions direct them to key assertions in each chapter and ask students whether they disagree, and why. As they think through their answers, they learn to define their own beliefs, and figure out how to put their thoughts into words. Throughout this process, they are building their critical analysis skills. Students are asked to respond to the material, but not in a way that tells them what they should think. There are no "correct" answers - you just have to be able to clearly defend your position. If I had it to do over again, make sure we each had a copy of the journal, so we could use it while we were reading on our own, and have our answers ready to bring to our discussion time. (Our printer is on the fritz, so printing three copies wasn't an option. I was lucky to get it to cooperate enough to print one!) It would have been better writing practice for them if I'd had them putting their thoughts down on paper. I can think of no better book on Christian apologetics than Mere Christianity. This companion journal would be a great resource to use with a high school class in a school or co-op, a Bible study at church or in a small group setting. It has been a great family devotional for us, although my little man is a bit too young for it. He has listened to our discussions, though, and I know he's absorbed a lot of it. It's been a huge help for my girls in understanding Mere Christianity, and I'm thankful for that. The Mere Christianity Journal is available from Home School Adventure Co.: $28.95 for the printed version, and $18.95 for the PDF. Stacy would like to offer you a 10% discount on any digital product, through May 15, 2014, using the code CREW-10. Connect with Home School Adventure Co. on Facebook, Twitter, Pinterest, Google+ and Instagram. Don't forget to check out Stacy's blog.